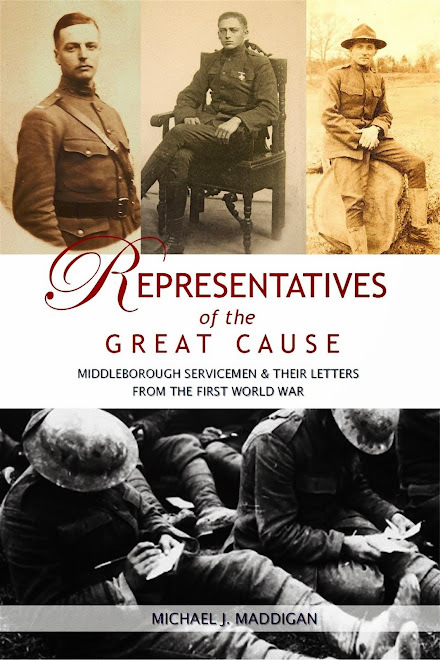 One of the shortest-lived industries in Middleborough was the manufacture of wooden thread spools which engaged a number of companies between 1857 and 1878 or sometime just thereafter. 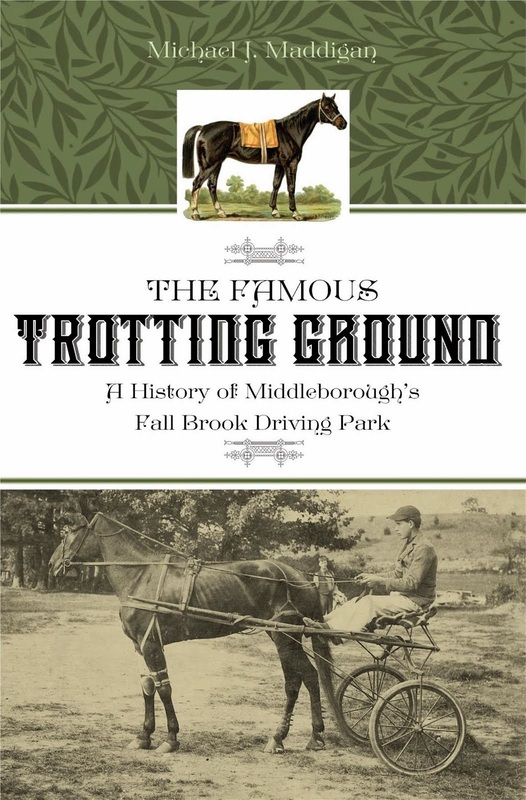 The manufacture of spools was a natural outgrowth of Middleborough’s lumber and milling industries which were expanding rapidly following the application of steam power to lumber milling in the mid-nineteenth century. The first firm to engage in spool manufacturing appears to have been Richmond, Pickens & Company at Middleborough Center where they were located on Vine Street in the former Middleboro’ Steam Mill building. In an effort to expand upon the Steam Mill’s former business, Richmond, Pickens & Company in 1857 began the production of thread spools from birch, a wood noted for its resiliency to stains. Though there is no record concerning for whom the firm produced its spools, one client required six hundred gross a week. 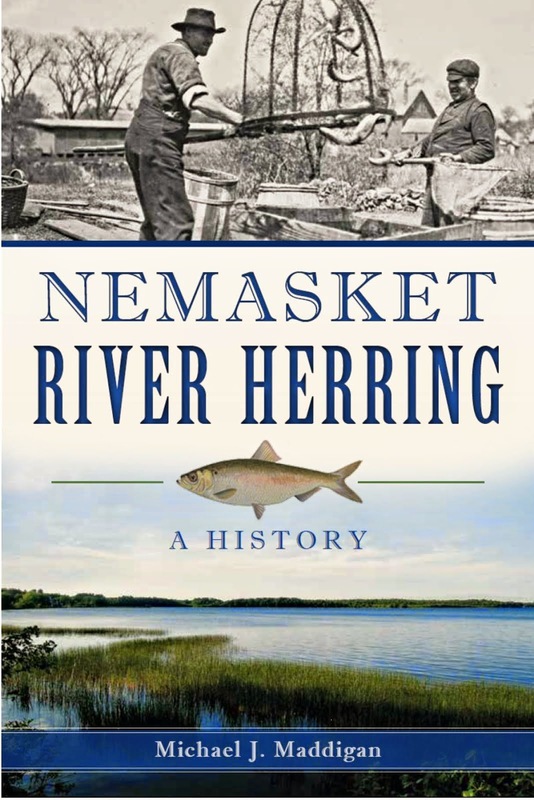 For this work, the company specifically solicited birch from local sources by advertising in the pages of the Nemasket Gazette: “Birch poles, from 1 to 2½ inches in diameter, wanted, for which the highest price will be paid at the Steam Mill, if delivered immediately.” The finished spools were packed in wooden shipping cases, also produced at the mill, though undoubtedly not from birch which was reserved specifically for spool manufacture. The Richmond, Pickens & Company’s manufacture of spools, however, was soon afterwards overtaken by the more lucrative production of trunk bodies, at which point the making of spools was discontinued. At South Middleborough, Benson & Smith were producing four hundred gross thread spools per week in September, 1858, a business which they entered into probably following its introduction at Middleborough Center. The South Middleborough mill was destroyed by fire on May 27, 1859, and destroyed along with the mill were its engine, spool machinery, and 1,400 gross of spools awaiting shipment. The firm was completely uninsured. Later, when Stillman Benson rebuilt the mill at a new location, the production of spools seems not to have been resumed. On April 5, 1859, Isaac Clark and J. W. King established a co-partnership known as Clark & King for the manufacture of thread spools at Middleborough Center. 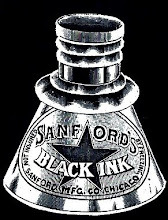 Shortly after its foundation, Clark’s brother, Ansel Clark, was taken into the firm which subsequently became known as Clark, King & Company. In May of that same year, the newly-renamed firm relocated its manufactory into the furnace buildings formerly occupied by Tinkham & Thompson on Vine Street near the former Middleboro’ Steam Mill. King’s association with the Clarks was short-lived. He departed the business on May 18, 1859, and the firm continued to operate as Clark Brothers. In October, 1859, the Clark’s spool manufactory burned to the ground and was not rebuilt, marking the end of spool production at Middleborough Center. Following 1859, spool manufacturing locally appears to have gone into abeyance. 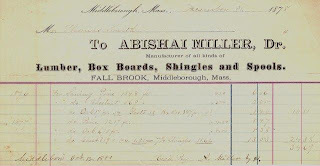 A decade later, however, in spring, 1867, it was revived when Abishai Miller added the manufacture of spools to his milling business at Fall Brook in a mill located on Wareham Street between Cherry and Sachem Streets. 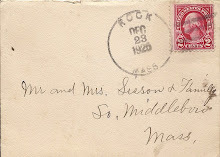 Miller engaged C. M. Lockwood of Fall River as the manager for the factory. It is not clear just how long Miller operated the thread spool manufactory. Lockwood died the following spring, but the business appears to have survived through the 1890s. Spool manufacturing failed to become a long-lived industry in Middleborough for a couple of reasons. 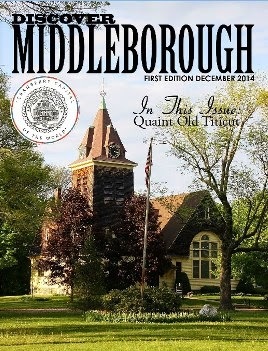 First, the simultaneous introduction of spool manufacturing at both Middleborough Center and South Middleborough undoubtedly rapidly depleted the already small local supply of birch which was required in quantity to satisfy the demands of the local spool mills. With the depletion of the local birch supply, Middleborough mills turned to milling those woods which grew in abundance in the vicinity, foremost among which was the white pine. Secondly, the various firms engaged in the production of spools discovered that the manufacture of trunks, trunk bodies and packing cases, as well as the simple milling of lumber, proved financially more remunerative than spool manufacturing which required an investment in machinery designed specifically to turn spools. 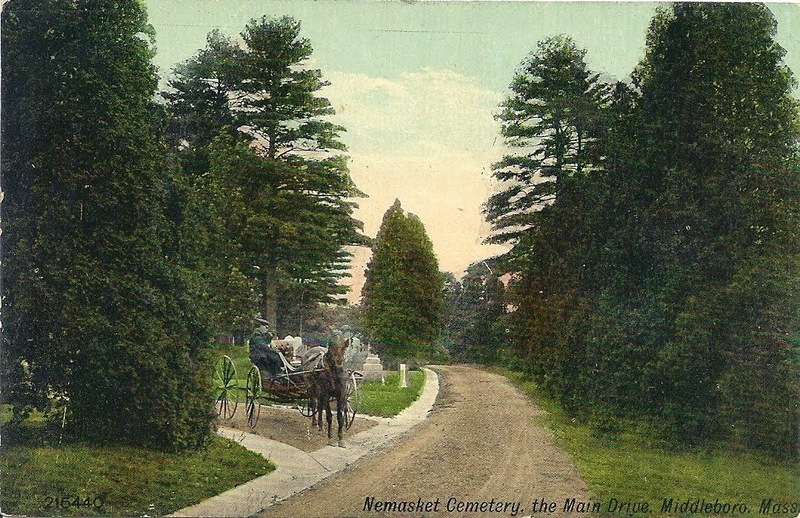 In the last decades of the nineteenth century, spool manufacturing would ultimately relocate to the larger lumber centers, such as Maine, where the supply of birch (and the profit motive) was much greater, leaving behind former centers of production like Middleborough. 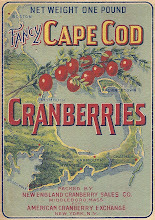 Bottom: Willimantic Thread Company trade card, late 19th century, paper, left (front) and right (reverse). 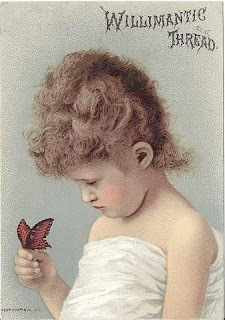 This Victorian trade card advertised spooled thread produced by the Willimantic Linen Company and for sale at George T. Ryder’s store in Middleborough. The mid-19th century thread industry required massive numbers of wooden spools for their product, and a number of Middleborough firms supplied that need for the quarter century following 1857 at a time when thread manufacturing was expanding rapidly. 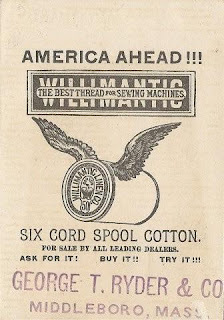 It is likely that Middleborough spool makers supplied only the smaller thread manufacturers as large firms like Willimantic produced their own spools. What were the reasons for the fires on these manufacturing plants? 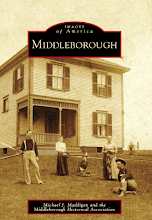 Middleborough's lumber mills and the manufactories which produced wood-related products like spools were always prone to fire. With no adequate means of fire prevention in place within these sturctures, the woodframe buildings frequently succumbed when fires did break out. The 1859 South Middleborough fire, itself, was later attributed to an engine in the Benson Mill.